It would be the last time Belfer saw Januscz Korczak, a trailblazing educator who spurned several offers of freedom, choosing instead to stay with nearly 200 orphans he cared for in the Warsaw Ghetto. From the ghetto, they were all marched to a transit station and shipped off to the Treblinka death camp in 1942. It was a defining event of the Holocaust, one that made Korczak, with his act of sacrifice, one of its most famous victims. Today, Belfer, a 92-year-old grandfather living in Israel, is the last of Korczak’s orphans able to recall interactions with the doctor, author and educator who revolutionized the cause of children’s welfare and became a national icon in Poland, with streets, schools and monuments honoring him. A noted artist in Israel, Belfer has made it his life’s mission to commemorate the man who, along with partner Stefania Wilczynska, had raised him from the age of seven. 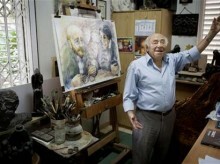 Belfer’s Tel Aviv apartment is filled with dozens of his sculptures and paintings bearing Korczak’s distinctive image: bald head, trim goatee and round, wire-rimmed glasses. The artist recently published an animated children’s book, “The Man Who Knew How to Love Children,” about his experiences in Korczak’s orphanage. Janusz Korczak was the pen name of Henryk Goldszmit, born in late 1870s Warsaw to an assimilated Jewish family. He was a well-known figure in Poland long before the war and among the most respected of Warsaw’s Jews, who made up a third of the city’s population before the German occupation. A pediatrician by training, he wrote several books for and about children and broadcast radio talks on education. With the help of wealthy benefactors, he founded a progressive orphanage for Jewish children in 1912 and another one for non-Jews. For three decades, he lived in an attic studio over the Jewish orphanage and nurtured his charges on a philosophy that said children should be listened to and respected. Korczak is considered the first pedagogue in Europe who fought for the rights of children, and the child-tending techniques he pioneered are still championed by followers around the world. Belfer vividly remembers the unique atmosphere in which the children were responsible for running the orphanage and setting the house rules. But it was Korczak’s bitter end that created his lasting legacy. After the Nazi occupation of 1939, the orphanage was ordered to be moved into the walled Jewish Ghetto, where Korczak shielded his wards from starvation and deportation. Because of Korczak’s prominence, the Polish underground offered to sneak him out of the ghetto to safety. But he declined, saying he could not abandon his orphans. On Aug. 5, 1942, during a wave of deportations from the ghetto, the Nazis rounded up Korczak, Wilczynska and the nearly 200 children. Dressed in their best clothing and with Korczak in the lead, they marched quietly across the ghetto to the transit station, from where they were all sent to their deaths in Treblinka. Many ghetto diary entries documented the chilling scene of that march, which became an epic symbol of Nazi cruelty. After serving in the Red Army, Belfer returned to Poland in 1946. His entire family — his mother, six siblings and grandparents — were all gone, as was the orphanage that had been his second home. To this day, he still hasn’t found out how and where his family was killed. Korczak went on to become a national hero in Poland. A statue in central Warsaw depicts him slumped, his arms around a group of children. A Jerusalem street is named for him and another statue of him shielding children stands at a Yad Vashem square. One of Belfer’s most famous sculptures of Korczak and the children is displayed in Gunzburg, Germany, but the artist says he hasn’t been able to replicate their final farewell. For years, Korczak’s surviving orphans gathered each Aug. 5 to honor him. Now, only three are still alive, two of them in ill-health, leaving Belfer as the final testimonial to the man. Belfer says his gratitude to Korczak is eclipsed only by his profound sense of guilt. “I left all my family. By what right? Because I was 16 and I thought the world was harming me and I needed to run away from this evil,” he said, his eyes welling up with tears.